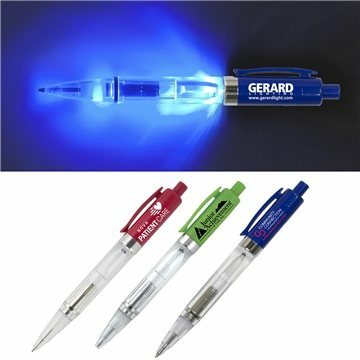 These pens feature an intense blue light. The plunger at the top of the pen activates the light and a simple twist of the barrel extends the writing tip. I would recommend using this company and this particular product! this was a perfect item for our purposes it satisfied our intended use of the product at all levels price, quality, usefullness to our customers and promotional quality. Everything to come out so perfectly. High quality and also the prices to match.